...reliable qPCR analysis in the blink of an eye. Import your data and rely on the various calculations available. The algorithms enable you to annotate and process your data according to international guidelines. All of this without having to know a single formula! Not only is qbase+ an easy way to analyse your real time PCR data - but it's also used by scientists around the world to get publication-ready results. "For analysis of real-time PCR data, I spent years using free Excel-macro based software and then my own Excel file. It was taking me hours to customize it to fit a particular analysis. The use of qbase+ has brought me a lot of convenience for a quick analysis of my datasets. What has changed for me over the past years is that I can be sure to properly handle the data, especially for advanced things that I was definitely not managing properly with Excel-based solutions, such as standard deviation, normalization with several reference genes and inter-run calibration." over 4297 scientists in 158 countries use qbase+ to improve analysis of their qPCR data. 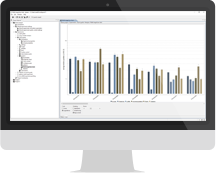 Easy, fast & reliable analysis of your qPCR data.